In 1969, during Australian administration of the Bougainville island as a UN Trust Territory, Conzinc Rio Tinto Australia (CRA) opened a large copper and gold mine with forced community evictions. In 1971, with pollution caused by the mine spreading, the issue of compensation went to the High Court of Australia. They ruled that the compensation was inadequate under ordinary federal Australian law, but that as an external territory, Papua New Guinea was not guaranteed the same standards that applied to mainland Australia. That was just the start of a grueling story of double standards and injustice. Forty years after the first verdict, court battles still go on. On 25th October 2011, Rio Tinto Group lost a bid to throw out genocide and war crimes claims in a lawsuit filed by Papua New Guinea landowners. A federal appeals court in San Francisco said claims of genocide and war crimes fall within the issues that can be considered under the Alien Tort Statute, a law of 1789 allowing non- citizens to sue in the U.S. for violations of international law. In 1989 indigenous outrage over twenty years of exploitation and pollution had escalated to the point where the Bougainville Revolutionary Army blew up the mine’s power pylons following the company’s refusal to pay local landowners US$5.4 billion compensation. A 10-year war of secession followed between the PNG Defense Forces, BRA and other armed groups on the island resulting in the ruination of towns and villages and estimated death toll of 20,000. 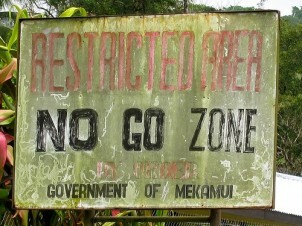 According to Michael Cornish, ‘Mismanagement of the relationship between the operation of the Panguna Mine and the local people was a fundamental cause of the conflict in Bougainville.’ The rebels now control the mining area but 40 years after the start of this story, nothing has been done to compensate for the huge damages. Rio Tinto is being brought to court in other cases as well. In December 2011, a group of US physicians (belonging to the Union of Concerned Scientists) and environmentalists sued the company for violating the Clean Air Act, in the state of Utah. They estimates the mortality, health and environmental costs to the community from the pollution caused by a giant mine just next to Salt Lake City to be between $2 billion and $4 billion. These two Rio Tinto stories are just a small glimpse of the hundreds of stories of environmental injustice throughout the world. EJOLT is doing a large inventory of such stories. The work on our database has started and will lead to an online, global and interactive map full of options for those seeking more information on specific cases.